Most posts on this blog focus on what to do and how to do it – providing navigational cues, designing with social media, stimulating recall, forming sticky ideas, and so on. In this post, we’ll look at what we do too much of, resulting in boring eLearning. It’s popular to hate PowerPoint because of the way a slide full of bullets strangles the life out of a presentation. But it doesn’t have to be that way. Have you watched a TED talk? Those presenters use text sparsely and convey messages with images more often than not. Though it may not be practical to avoid text completely in eLearning, we can minimize it through diagrams, images that communicate, and occasional videos. Think visual design. Discovery learning can help too. Instead of telling learners all they need to know, pull them into an activity, or a problem to solve, early in the lesson. Gradually provide the information they need through coaching along the way. This helps shift the focus from reading to doing. Even if the “doing” still requires reading, it’s likely to feel more purposeful. Though it’s not our only option, we can accomplish this in PowerPoint. The slides are simply a blank canvas – we make them interesting or boring. The reminder here is to weed out nice to know from need to know information. For instance, I’ve seen many systems training modules that list steps in a system-driven procedure and offer tips for completing the procedure correctly. I say “system-driven,” because I’ve seen this with procedures where the system literally leads the user through the steps and controls for certain types of errors. 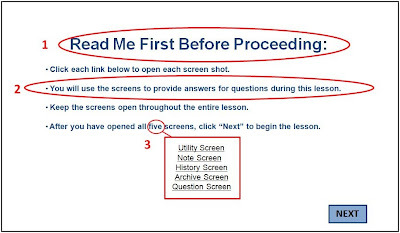 This means that filling eLearning slides with detailed steps and tips is probably unnecessary. The learner just needs to know when to use the procedure and how to get it started (perhaps followed by a simulation to give a feel for the flow)...which requires much less text. We know that reviewing content and repeating important points helps solidify information in memory. But what about other forms of repetition? How much variation do you design into your eLearning activities and knowledge checks? Do your knowledge checks always take on the structure of a short scenario followed by a multiple choice question? Do they maintain the same level of difficulty, even as the learner progresses through training? Even rapid authoring tools generally have a variety of interaction types available. And in many cases, a smaller number of rich and highly interactive activities may be more impactful than numerous short, similarly structured knowledge check questions. Although we should write training materials concisely, they don’t have to lack personality. Stale writing becomes boring fast. We’ve probably all had the experience of reading a textbook, only to reach the end of a page and realize that we remember nothing from the past couple of minutes. We were reading, but we were not engaged. It’s possible to write professionally and conversationally. Think about blogs – many opt for an informal tone, yet they communicate professionally. Telling stories can help. And occasionally convey enthusiasm. Write to inform...and even entertain from time to time. What else do we do too much of? In what other ways do we challenge learners to stay awake? Add your observations in the comments! Over the past year or so, I’ve noticed several comments about how Kirkpatrick’s model of four levels of evaluation is outdated. The debate reappeared on my radar in a Twitter #lrnchat session a couple weeks ago. Evaluation was the discussion topic, and several tweets mentioned that the model originated in the 1950s, a lot has changed since then, and we ought to follow a more current model. Before digging into its pros and cons, let’s do a quick mini-review of the model. Level 1: Learner opinions. Did they like the training? Level 2: Performance during training. Are learners meeting the stated objectives (typically via quizzes, practice activities, skill assessments, etc.)? Level 3: Performance on the job. Are they demonstrating the expected behaviors on the job? Are they meeting expectations in terms of quality, quantity, etc.? Level 4: Organizational impact. How did training outcomes impact the organization, quantitatively and qualitatively? What was the return on investment? Does the model include anything irrelevant? An initial gap analysis should identify specific business needs (level 4) and what is required to fulfill those needs (level 3). So it makes perfect sense that we’d evaluate those same things later and report results when we can. It also makes sense to assess learners’ knowledge and performance during training (level 2), for the sake of corrective coaching, encouragement, and potentially offering additional support to help learners prepare for on-the-job application. When it comes to learner satisfaction (level 1), there’s a lot of talk about the tendency to focus too much on this and too little on the other levels. I agree that’s a mistake. That said, I still want to know how learners felt about their training, for the sake of improving the experience, working out bugs, and potentially helping to identify the causes of any results gaps. Does the model leave anything out? Though it’s common to track “butts in seats” and other attendance-related metrics not accounted for in the model, these measures seem more related to staffing and forecasting as opposed to training results. We talk a lot about the need for improved diligence in the field with measuring job performance and business results. I agree that we should do this consistently. And so does the model (levels 3-4). Like any model, Kirkpatrick’s four levels has limitations. A few disclaimers: I’m not trying to suggest that it’s perfect. And I’m not trying to suggest that it covers everything we need to think about related to evaluation (and in fairness, I doubt this was ever the intent). Nor am I suggesting that following the model makes evaluation easy. Some criticize the model because it seems to focus exclusively on a learning event, when learning is actually an ongoing process. Even if Kirkpatrick was thinking about learning “events” when introducing the model, I think the levels can apply to learning as an event or an ongoing process. The model suggests the types of results to measure. It’s up to us determine the subject we’re evaluating (event vs. something ongoing) and how to collect and analyze the data. Some criticize the model because it neglects confounding variables, such as post-training support from learners’ managers and ongoing accountability. These are just a couple of examples, and I agree that factors like these are critical to a training initiative’s success. So perhaps we still measure the things outlined by the four levels, while also investigating how those other key variables helped or hindered the effort (Brinkerhoff’s Success Case Method can help). Many insist that we should flip the model upside-down, with organizational impact and on-the-job performance as the first levels. I can see how numbering the levels might suggest prioritization or sequence. So with that interpretation, presenting the levels in reverse order makes a lot of sense. My view of Kirkpatrick’s model is that it suggests what to measure to help determine how successful a training initiative was, but it doesn’t spell out how to scope and execute the evaluation effort. So with that in mind, I believe that the model is still relevant and useful today. Even if we need other information sources to help us with the rest. Do you agree? Disagree? I’m sure I haven’t thought of everything here, so please take a moment to share your two cents! Imagine that you are out for a drive in the country. You’re cruising along, and you pass several little towns. Soon, you realize that you are in an unfamiliar area. You consult your maps, but you still aren’t sure where you are. You drive up to a crossroad, where the road veers off to the left on one side and to the right on the other. There is no sign to tell you which way to go. Sometimes, learners feel this way during an eLearning lesson. What causes learners to lose their way in lessons? What can instructional designers do to help keep learners going in the right direction? This post offers advice for two scenarios where learners may lose their way in eLearning. Most simple lessons are fairly straight-forward with how the navigation works. You have forward and back buttons for page-to-page, linear navigation, and usually a home button to go back to the beginning of a lesson. But suppose you’re designing a lesson where learners need to open and use screens from a program to answer questions during the lesson. A variance in normal lesson navigation can confuse learners if it is not explained well, and if learner attention is not drawn to the variance. (1) State clearly and with minimal words what the learner should do. Don’t make learners “wade through” lots of words to find needed instructions. Use a different sized font to draw attention. (3) Provide word clues tied to the action needed. In the example below, the word “five” reinforces to learners that there are a total of five screens to open. When providing instructions within a lesson, sometimes words are truly inadequate to provide enough guidance to complete a task successfully. For example, you might need more than words if you are explaining how to use a delicate piece of equipment, or if you are writing procedural steps for a complicated process. Instructions can especially be difficult to convey if learners already have an idea in their minds as to how a product and its instructions should work. But if the product works differently than expected, then the instructions will also be different than what might be expected. An example in point: Removing a memory card from a digital camera. Most of us have experience removing memory cards from digital cameras, and we have a good idea how it should be done. Usually, memory cards are located on a side area of the camera by themselves. How would you convey instructions if your camera’s memory card is located over the camera’s battery? The care with which you remove the card so you don’t also remove the battery is important. In an earlier post, Dean Hawkinson used a similar technique of using pictures to guide learners. Instead of callouts, Dean used color emphasis to draw attention to screen areas. Check out Dean’s post Publishing in Adobe Presenter for some ideas. What are some examples where you provided clues and guidance to learners to help them stay on the right track? I would be interested in hearing about your experiences!